It is 2 am on a relatively busy shift on a Saturday night in the ED. EMS arrives with a 27-year-old male involved in a high-speed motor vehicle collision. He was not wearing a seat belt, and he was found ejected from the vehicle. Upon EMS arrival on scene, the paramedics found him unresponsive, with a GCS score of 9 (E2, V3, M4). The patient had been alone in the car, and he did not have identifying information with him. His vital signs included: blood pressure of 110/80 mm Hg, heart rate of 126 beats per minute, shallow respiratory rate of 8 breaths per minute, and oxygen saturation of 96% on room air. The paramedics attempted an oral airway, but it was aborted, because the patient exhibited a gag reflex. Bilateral nasal trumpets were placed, and a nonrebreather facemask with 100% oxygen was administered. He had deformities to his right ankle and left forearm. He smelled of alcohol. The patient was transported on a backboard with a rigid cervical spine collar to maintain immobilization. 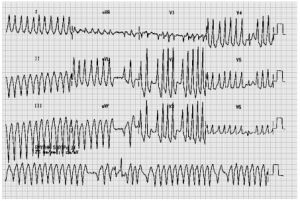 As you evaluate him on arrival to the ED, his vitals are essentially unchanged; however, you note that his GCS score is now 7 (E2, V2, M3), as he flexes his right arm to painful stimulus. IV access is established, and as you prepare to endotracheally intubate him, you recognize that this patient’s survival and ultimate neurologic outcome may depend on your initial management. 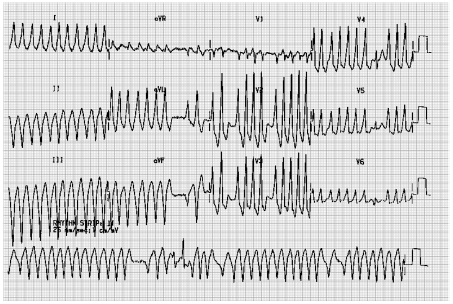 The first patient’s ECG (shown below) shows AF with preexcitation consistent with Wolff-Parkinson-White syndrome. Because the patient was hemodynamically stable, you obtained 2 large-bore peripheral IV lines and began an infusion of procainamide, coadministering a normal saline bolus. She converted to normal sinus rhythm and felt much improved, with normal repeat vital signs. Her repeat ECG showed a short PR interval with delta waves. She had no prior history of this, no past medical history, and a CHADS2 score of 0. You consulted cardiology for an electrophysiology study, and she was successfully ablated and discharged home. Download free risk management pitfalls for Atrial Fibrillation. Congratulations to Dr. Sanders, Dr. Marwah, Dr. Blaine, Dr. De Silva, and Dr. Chari — this month’s winners get a free copy of the latest issue of Emergency Medicine Practice on this topic: Atrial Fibrillation: Management Strategies In The Emergency Department. Didn’t win but want to get a complete systematic, evidence-based review on this topic? Purchase the issue today including 4 CME credits!